Let us employ the little grey cells for a moment in appreciation of one of the greatest fictional detectives of all time: Agatha Christie's Hercule Poirot. Between the 1920s and the 1970s, the Belgian detective appeared in 42 novels and short story collections. He has been portrayed on screen many times, most recently by the British actor David Suchet. 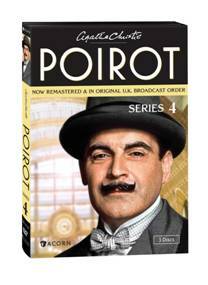 Thanks to Acorn Media, I'm offering one lucky person the opportunity to win a special prize pack of Agatha Christie’s Poirot, Series 1-4, (valued at $160.00)! These 10 full-length mysteries star fan-favorite and BAFTA nominee David Suchet as the brilliant Belgian detective. Based on the novels by Agatha Christie, these lavish adaptations capture every splendid detail of the Art Deco era. 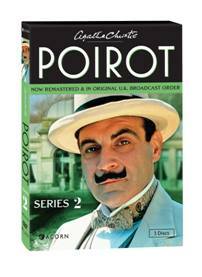 ITV Studios’ Poirot has aired on ITV1 in the U.K. since 1989 and on PBS and A&E in the U.S. The 3-vol. DVD set includes all 10 mysteries from the first series, now with SDH subtitles. Series 2: The diminutive detective returns in these nine full-length mysteries, starring beloved actor and BAFTA nominee David Suchet as a “near-perfect Poirot” (USA Today) in these sumptuous adaptations of Christie’s bestsellers. 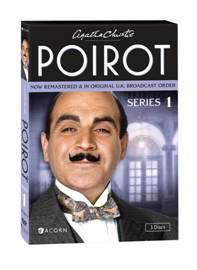 Series 3: The impeccable Hercule Poirot (David Suchet) is back on the case in these 11 mysteries from the hit series. The Mysterious Affair at Styles—Poirot and Hastings tackle their first case together. How Does Your Garden Grow?—Poirot cultivates leads in a murder case. The Million Dollar Bond Robbery—The detective investigates an international banking caper. The Plymouth Express—Poirot is called in when a case of romantic intrigue turns fatal. Wasps’ Nest—Hastings’s new photography hobby helps Poirot crack a case. The Tragedy at Marsdon Manor—A writer calls Poirot for help untangling his own plot. The Double Clue—The detective seems taken with an exiled countess while investigating a jewel heist. The Mystery of the Spanish Chest—Poirot is a guest at a dinner party that turns deadly. The Theft of the Royal Ruby—An Egyptian prince learns a difficult lesson about who to trust. The Affair at the Victory Ball—A costume party becomes a crime scene when two revelers are murdered. The Mystery of Hunter's Lodge—A wealthy landowner becomes the quarry during a hunting party. Series 3 also stars Hugh Fraser (Sharpe) as the affable Captain Hastings, Philip Jackson (Little Voice) as Chief Inspector Japp, and Pauline Moran as Miss Lemon. 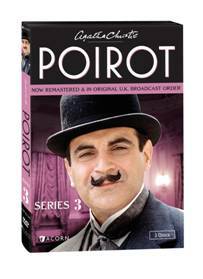 Series 4: The endearingly eccentric detective Hercule Poirot (David Suchet) is back on the case in these three feature-length mysteries from the hit series. The ABC Murders— Poirot investigates the baffling mystery of a murderer who announces his next victims through a series of chilling letters, each addressed to the detective himself. One, Two, Buckle My Shoe— When a popular dentist is gunned down, a murderous chain of events ensues. A broken shoe buckle becomes the key to untangling a deadly web of deception. Series 4 also stars Donald Sumpter (Game of Thrones), Christopher Eccleston (Doctor Who), Hugh Fraser (Sharpe) as the affable Captain Hastings, and Philip Jackson (Little Voice) as Chief Inspector Japp. That's a lot of Poirot! To enter to win this amazing series, just leave a comment stating your favorite mystery author. Be sure to leave you email address in the comment (or on your Blogger profile, if you have one) so that I can contact you if you are the lucky winner. Open to US residents only. Enter by April 15. The winner will be selected by Random.org and contacted by email. Thanks so much to Acorn Media for providing this wonderful prize, and good luck! I like Agatha Christie's works. I'm a fan of Christie, but my two favorite contemporary mystery writers of Laurien Berenson and M.C. Beaton. Thanks! I really like Jonathon Kellerman, but I've read all of Chritie's novels, too! I love Christie and P.D. James! I have so many favorites...recently, I have been enjoy Rollins. :-) Thank you. Belgian detective and chocolates...my favorite! i love agatha christies books! Agatha Christie and Arthur Conan Doyle are both favorites of mine. I like Agatha Christie, but I am also a fan of Jeffrey Archer. I like Agatha Christie, as well as some Robert B. Parker occasionally. I like Lawrence Sanders, his Mcnalley series is such fun. I love Agatha Christie! Shes my fave! I love Lawerene Sanders Books. Agatha Christie got me started reading mysteries and is still my favorite but I love Jane Haddam, Sir Arthur Conan Doyle and for cat related ones Lillian Braun jackson. Agatha Christie is my favorite, although i read them all. Agatha Christie was always my favorite. My love of mysteries started with Agatha Christie and now I enjoy reading Mary Higgins Clark. I don't read many mysteries but, I love the Poirot. I guess I would say Agatha Christie. I've always liked Mary Higgins Clark.